As I write this, the movie Death on the Nile is droning on in the background. This is strangely appropriate as I am currently in the Agatha Christy suite, which is, they assure me, the best room in the Royal Seven Stars hotel located in the quaint and quirky village of Totnes in South Devon. For those of you who haven’t been following this blog closely (and if not, why not? ), Totnes is the location of one my employer’s customers, so I have spent a good deal of time here over the past year and a half. The Canal, the bit I am really familiar with. It’s a welcome departure from the places I usually travel to for work—inner city Travel Lodges, Premier Inns on the local industrial estate—but that’s not the only thing that makes this trip different: this time, I’m on holiday. I finally got fed up with staying in such a pretty location and only seeing the hotel and the short, but beautiful walk along the canal to our client’s offices. So I booked a long weekend and my wife and I have spent the past two days exploring the town and the surrounding countryside. It’s been an interesting holiday, staying in a place that is so familiar, yet made foreign by having different things to do and my wife with me. The room is a bit different, too. I usually have a single, but I’m a guy who knows how to treat women so I booked the most expensive room at the hotel for our stay (actually, all the other rooms were booked this weekend, but we don’t have to tell my wife that, do we?) It’s large, with a sitting area (where I am writing) and a big four-poster canopy bed (mink handcuffs not include*) where my wife is lounging after a hard day of exploring the retail opportunities of Totnes and watching the big screen TV. All she needs is a little bell on the sideboard to ring for maid service. The bathroom is the size of our spare bedroom back home and comes with a shower and a double sized bathtub/Jacuzzi (of course we did). But the luxury suite aside, there are other things to consider when bringing your wife to a place you are so familiar with. When we checked in, the staff knew me, and called me by name. I felt a little like Benjamin Braddock in the Graduate when he brings Elaine to the Taft hotel where he is schtuping her mother, and found myself hastily introducing my wife in case the hotel staff had assumed that, after 18 months of staying in single rooms by myself, I had finally pulled. Then in the dining room on the first morning, the waitresses demonstrated an alarmingly thorough knowledge of my breakfast preferences and morning habits. In a more cynical woman than my wife, this might have aroused a degree of suspicion. All that aside, we’ve been having a wonderful time. 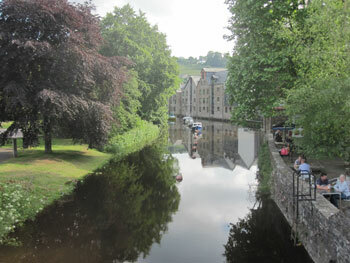 Totness is a charmingly eclectic village where the well-heeled and those of the Bohemian lifestyle mingle easily. It is also, apparently, where old hippies come to retire. The local attire is refreshingly different, as well; whereas, back in Horsham, the only remarkable nature concerning fashion among the young is its uniform skimpiness, here it is the dizzying variety of individual nonconformity. It’s a bit like Brighton, but smaller, more intimate and without the raucous nightlife. 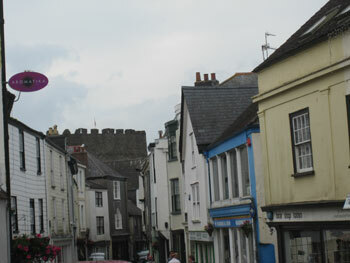 Totnes High Street, with the local castle in the background. I must close now as we’re getting ready to go out to dinner with some friends. Yes, I’ve lived in Sussex eight years but have made no friends among the local Horshamites or my co-workers, but in my visits here I have become familiar enough with people to keep in touch with them and visit with them when I return. Tonight we’re going out with James and his fiancée Jenny. James runs an organic flower business and routinely dresses as if it is 1860. But this is Totness, so that is considered quite normal. *I jest of course; the room is very tastefully furnished; there are nine mirrors in the room and not one of them is above the bed. good job you got the chance to introduce the missus before the staff started nudging and winking with each other. That would've been priceless. Wow! "The Canal" brought me back to an old radio show called "The Goon Show". Years ago I got some cassette tapes and listened to Peter Sellars, Spike Milligan et.al, as they ranted about "The Canal". It was really funny! Hmmm, I'm going have to find it and listen to it again. Thanks for the memory boost. It looks like a lovely place to visit. I also really liked James's website - he looks like a character! It is a lovely place, and James is quite a character. I'm looking forward to going back soon.